A Best-One newsagent in Manchester. 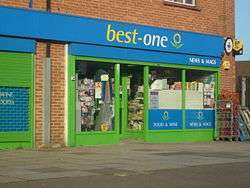 Best-One is a chain of convenience stores based in the UK and Jersey CI. The company has over 600 stores throughout the UK. Most stores are owned on a franchise basis and most stock is sourced through Bestway Cash & Carry. The company's flagship store is a 3,000sq ft outlet in East London. The flagship store provides a more upmarket offering to customers who work in the financial services sector at Canary Wharf. Best-One is a segment of the Bestway group which is owned by Sir Anwar Pervez. ↑ "Retailers". Best-one. Retrieved 2011-01-02. ↑ "Bestway pushes ahead with Best-one Express convenience format | Independent News". TalkingRetail.com. 2007-06-01. Retrieved 2011-01-02.